Unemployment numbers for September were higher than anticipated and this helped shake the markets. The truth is that the trend of lower losses is continuing and the market is still focused on everything getting less bad. While the data was worse than expected, we need to look at these numbers as 1 or 2 month averages and there is clearly and improving trend. Rail traffic looks flat as of the last part of September. 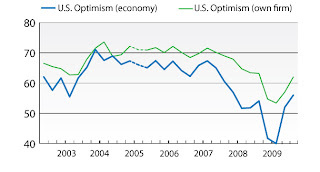 Optimists will say that we are turning south and pessimists will suggest that we aren't improving. As we enter this season we should begin to see shipping and transport data ticking up because we are entering into the part of the year where Christmas inventory and orders are being stocked. If we don't begin to see an uptick in these charts as we normally would we will have our first indications that the rally may be ending. Lumber and Crushed Stone are indicative of the pipeline for growth in commerical and residential real estate. No trend changes are apparent in these items. As we've stated before, no matter how high banks, REITs, and home builders go, we would avoid them. The Financial Conditions Index continues to maintain it's trend of improvement. There has been a slight dip over the course of the last week, however we won't do much more than raise an eyebrow at this metric unless we see other data that confirms this warning. Index numbers over 0 (zero) indicate that the economy as measured through fixed income and money market liquidity metrics is growing and expansionary. We are not going to signal the end of the recession, but possibly could as we near zero. Duke released its September CFO survey results again. CFO's believe that things are looking better for the overall economy and their own firms. In general they are more positive. This change is not overwhelming, but given that most CFOs are going to more conservative than their CEO or COO counterparts, we should take heed here to recognize the potential for real growth during earnings season (starts later this week) and then next two months. The AAII Sentiment numbers continue to remain in no-mans land. Remember, when sentiment reaches an extreme (bullish or bearish), we usually want to do the opposite. In this case there are a mixed number of folks that believe in this rally and an appropriate amount of investors that are bearish. The confusion confirms exactly what we are seeing with big up and down days as traders attempt to sort out the direction of the market. Anyone seeing anything familiar here? We had a couple of days worth of a head fake last week that was just enough to ensure that we were on our toes. This has merely provided us an opportunity to buy more of the types of holdings we've discussed in the last several months. "Carry on, nothing to see here!" 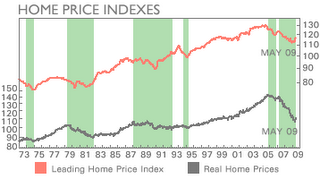 I've left the home price index graph up here simply as a placeholder since it hasn't been updated yet. Why is it important? It is important for several reasons. First, home price stabilization is the basis for much of this rally. If you recall, Ben Bernake and Hank Paulson repeated told us that if we can simply stabilize the home market, we'll see the economy recover. In their efforts to stabilize home prices they have become the mortgage lender of choice for most of the deals getting done. Directly you ask? No, but lenders are being supported as the government backstops the entire mortgage market. By buying these mortgages and also controlling treasury rates, the fed has created an artificially low interest rate environment. What else is going on here? We are hearing that banks continue to pile up foreclosures on their books, but refuse to release them for sale on the market. Other stories highlight that many ex-homeowners still remain in homes they haven't paid a mortgage on for many, many months. How can they stay and not pay? By keeping foreclosed properties in "defaulting" status rather than taking receipt of the properties, banks don't have to recognize the huge losses they are saddled with. Our regulators sit idly by as banks game the system and overstate the assets on their books and earnings. The hope is that by controlling the flow of foreclosures coming to market they can extend the period until the market recovers. Is it working? Well, according to the graph, it might be. I would guess that as soon as there is a noticeable stabilization or increase in pricing a new wave of sellers will come to drive prices down. No matter what, banks and the government are both giving it all they have to keep prices afloat. Their ability to sustain this is a key driver to the continued resurgence in the market. Are there still concerns in the housing market? Yes, people continue to lose jobs and people continue to stop paying mortgages. We are coming into more trouble as a new barrage of bad loans are due to reset to higher interest rates. These are the option ARM loans. Many of these loans were "interest only" loans for a period of 5 or 7 years. Borrowers took these loans out with the assumption that they would have increasing home values they could then use as equity to refinance with, or they were used by folks that needed low interest loans because they were maxed out and didn't have the ability to pay more. These loans are due to reset in 2010 and should unleash a new wave of homeowners that cannot afford to own. Ok, so everything is possibly negative, does it impact our trading? No! Why would reality impact the way we trade? Of course I'm being silly here, but the reality is that the numbers are showing that the pricing data is turning north and this alone will be the basis for optimism in the market. We need to be constantly watching for further improvement to reinforce our short term bullishness. If we get socked with negative news, it is another warning shot across the bow that we need to exit long trades and be more conservative. Given the data we've presented lets summarize it like this. US Dollar - Declining. It took a pause and now continues its retreat. Other items - Consumer Sentiment has still not improved as much as the rally in the market would suggest. We need to continue to eye these figures. Government's entire strategy is that stabilizing the housing market will cause a rebound in consumer spending which is 70% of our economy. If the consumer remains on strike and buys less and demands lower prices, the planned recovery will fail. Earnings Season - I eluded to earnings season starting this week. I believe that most company reports will beat handily the lowered and managed expectations. We may have continued upward movement here to celebrate how "great" these firms are doing. I say take it while they are coming, but we need to watch carefully for a "sell the news" reaction as we close down earnings seasons. Next quarter's earnings will be easy to beat as well and this is the reason I continue to look at February and March of 2010 as really critical months. These certainly could be the months when the euphoria wanes and gravity reasserts herself after a 9 month vacation. OK, How do we play it? It seems pretty simple doesn't it? Keep doing what we covered the last three months. Watch the dollar and invest in base metals, commodities, foreign / overseas countries and etfs, and buy other currencies if you are sophisticated. Silver and Gold have been big recent winners along with Brazil. The Dow Jones Industrial Average has actually lagged in performance the other assets I watch with the exception of corporate bonds. High yield bonds though have continued to outperform. Dollar strength will indicate a turn, but at this point I don't believe that the Federal Reserve desires to change the dollar's direction or they would have already intervened. I think that they will allow for the USD Index to fall another $2 or $3 before supporting it. Therefore, we continue to believe that the types of trades we have on will perform well and I am adding more of my money in the market. Remember, I look at these trades on a daily basis, so my trades probably won't look like yours. Many are invested in mutual funds and are locked in for 30 days when buying. This time requirement should give you pause as you think through the possibility of a sudden reversal. Am I saying don't do it? No, but you can lose money and you need to be aware of the risks! A couple of last words. Energy and Utilities have also lagged lately, they may be areas to examine and enter as well. Have a great month and watch the dollar!